In most people’s minds, we all want “perfect teeth,” don’t we? They should be straight, with no gaps, pearly white, and make you look like a million bucks, right? Singers especially want nice looking teeth, since they’ll be showing them off to audiences. But what about people with “bad teeth?” Sometimes, “bad teeth” actually help define singers… in a good way. They become known for whatever is unusual about their look– take Freddie Mercury, for example. The musical movie Bohemian Rhapsody has been very popular during the past year, with millions of people enjoying Rami Malek’s outstanding portrayal of Freddie Mercury, the front man for the British rock band Queen. Interestingly, Mercury believed his buck teeth helped give him the undeniably amazing voice he became world famous for– he believed his teeth gave his voice a special resonance. When he was a young boy, he was self-conscious about his teeth. Kids would pick on him, calling him “Bucky.” Yet when he started becoming known as a rock singer, he decided NOT to get orthodontic treatment to fix his “malocclusion.” Why? Well he thought if he “fixed” his teeth, his magical voice might go away! Ever wonder why he had a mustache? He grew it to try and disguise his buck teeth. He’d often put his hand up to his mouth to cover it while talking to people. It just goes to show that even famous people are real people who get self-conscious and have “issues” with themselves. Now researchers have often wondered if Mercury’s buck teeth really did give his voice a magical quality, so they studied the way he sang… Researchers found that he was a baritone who sang as a tenor, using exceptional voice control. Also, he didn’t just vibrate his vocal cords like most singers do; he activated his vestibular folds– giving his voice that unique growl. But did they discover the answer to their main question? Sorry, no they did not. Did those buck teeth stand his voice out from the crowd? Most likely yes, though no one knows for sure. 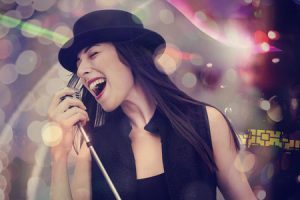 That said, maybe you have something unusual about the way you sing or you have something unusual about your mouth, nose or teeth that allows you to sound just a bit different from others… if so, that could be your greatest gift! Besides Freddie Mercury, can you name other singers who’ve had “bad teeth” at one time or another? Macy Gray and Jewel come to mind… can you think of others?